The 1586A Super‑DAQ is the most accurate and flexible temperature data acquisition system on the market. It scans and records temperature, dc voltage, dc current, and resistance for up to 40 input channels and scan speeds as fast as 10 channels per second. 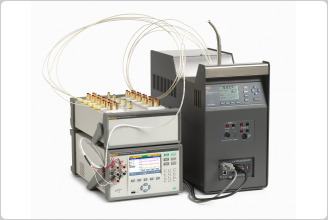 The Super-DAQ can be configured for use as a multi-channel data logger in the factory or as a precision reference thermometer for benchtop sensor calibration in the lab. Learn how to automate the calibration of up to 40 temperature sensors. The 1586A Super-DAQ collects time-stamped precision temperature and electrical measurements for data analysis by technicians, engineers, and quality control personnel to verify process control, analyze interactive systems, ensure conformance to quality standards, or to correlate related events for R&D or troubleshooting. Measurement data and statistics can be viewed in tabular format for all active channels. With the graphing feature, up to four channels can be plotted at the same time, making it easy to quickly assess test setup and results before analyzing the data on a PC. 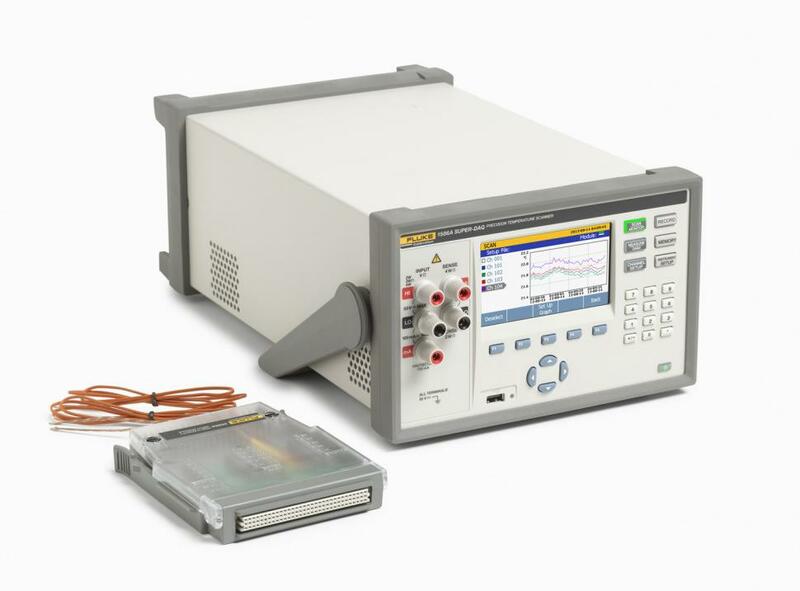 When configured with the DAQ-STAQ Multiplexer, the Super-DAQ has the accuracy of the best benchtop reference thermometer readouts for calibration of PRTs, RTDs, thermistors, or thermocouples. 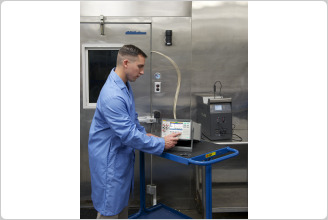 Lab efficiency can be increased when the Super-DAQ is connected to a Fluke Calibration drywell or bath and Automated Sensor Test routines are run. The 1586 is ideal for a number of applications such as thermal mapping, temperature validation, process sensor calibration, and more. These applications are found in a various industries including pharmaceutical, biotechnology, food processing, aerospace, and automotive. Some temperature data acquisition applications require compliance to government and standards agency requirements. TQSoft and TQAero thermal validation software help engineers, technicians and lab managers to meet the key guidelines for temperature data collection. These software solutions provide a complete qualification, reporting, documentation, and audit trail management system. For factory applications, the Super-DAQ is configured with the internal High-Capacity Module. Connecting thermocouples or RTDs to input terminals can be time consuming—especially if you're using many sensors of the same type for one job, and then switching to a different sensor type for another job. The internal High-Capacity Module allows you to pre-configure multiple input modules and simply exchange one module for another, depending on your test requirements. Recall a stored test setup to make the changeover even faster. And if you prefer, you can always measure a variety of different input types at the same time in a single High-Capacity Module, including thermocouples, RTDs, voltage, resistance, or current. For a calibration lab where accuracy is of primary importance, the Super-DAQ is best configured with a DAQ-STAQ Multiplexer. The external DAQ-STAQ features mini-jack thermocouple terminals—each with its own reference junction sensor—and patented mini-DWF, gold-plated input terminals, which accept bare wire, spade lug, or mini-banana-plug terminations. 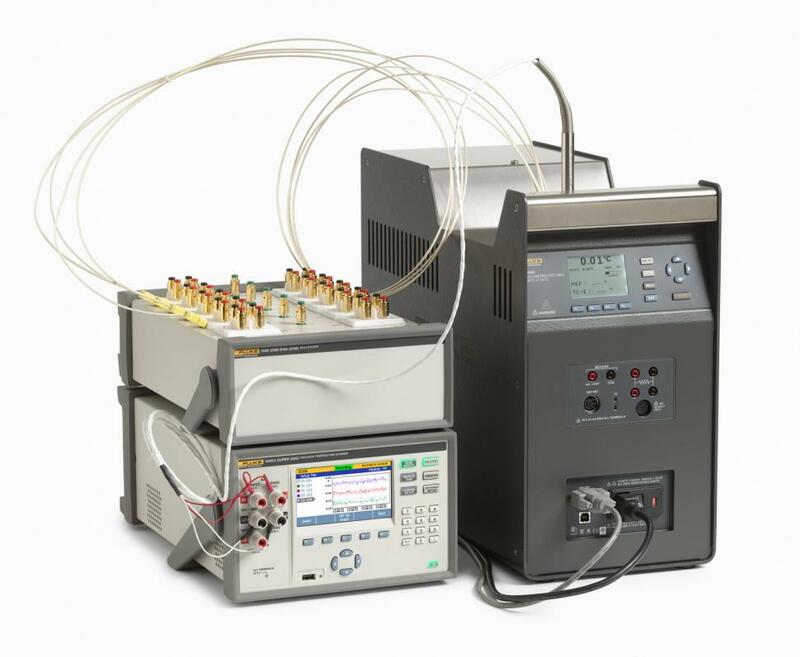 Easily connect and disconnect PRTs, thermistors, and thermocouples for benchtop temperature calibration. It can be stacked on the 1586 to reduce footprint in busy labs. Flexibility to configure the Super-DAQ for factory or calibration lab use reduces your equipment needs and cost. The Super-DAQ can operate in four modes that let you scan, monitor, measure, or function as a digital multimeter from a single instrument. Sequentially scan through channels based on a user defined test. Monitor any single channel during a scan, without interrupting the scan. 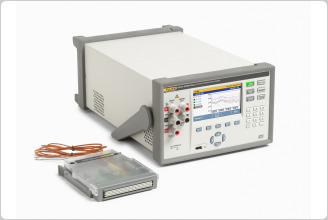 Measure and record data on a single channel without the need of a pre-configured test file. Or in DMM mode, use the front panel channel like a familiar benchtop digital multimeter to quickly measure dc voltage, dc current, or 2-wire and 4-wire resistance without the need to configure the channel. The Super-DAQ includes 20 MB internal memory that can store over 75,000 time-stamped readings. Data and set-up files can be easily moved to a PC for analysis using a USB flash drive or over a network using the LAN interface connection. The Super-DAQ also includes two levels of data security to prevent unauthorized users from tampering with or forging test data or setup files. This security feature is especially important to industries that are regulated by government agencies where data traceability is required. With the Automated Test feature, you can automate sensor calibration without a PC and software. 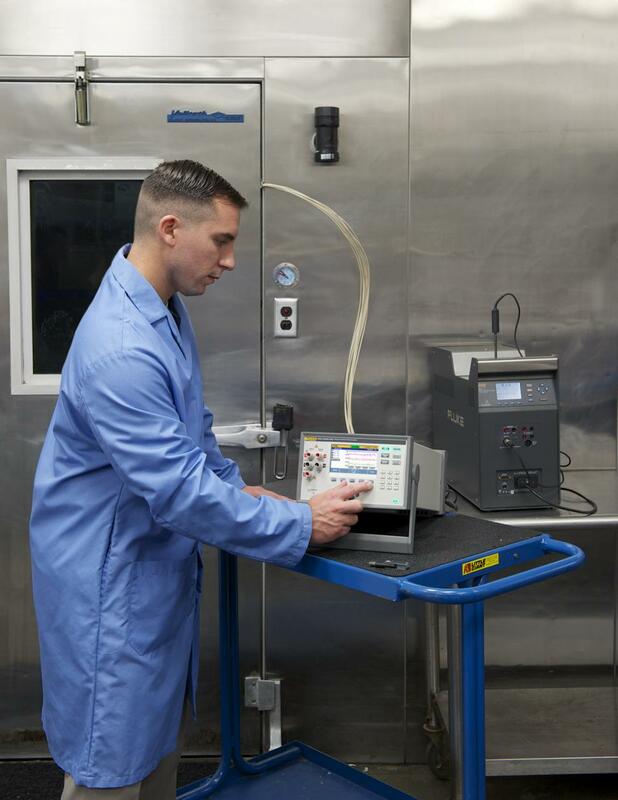 When connected to a Fluke Calibration drywell or fluid bath via the RS-232 interface, the Super-DAQ takes control of the temperature source and runs your calibration automatically. You simply program the number of setpoint temperatures and their values, select a scan sequence (linear, alternate, up/down), assign a reference channel, and set the required stability band. The Super-DAQ monitors the temperature source's stability via the reference channel, collects the data once stabilized, and then advances to the next setpoint temperature. After you configure and start the test, you can walk away to work on other things. The Super-DAQ just made your day a whole lot easier. Conformity CE, CSA, IEC 61010 3rd ed. Accuracy specifications generally apply with medium and slow sample rates (unless otherwise noted), after a warm-up time of 1 hour, and within an environment temperature range of 18 °C to 28 °C, and may depend on the channel. The confidence level for accuracy specifications is 95 % within 1 year of calibration. Accuracy is given as % of measurement or ohms, whichever is greater. Basic accuracy is for 4-wire PRT/RTD. When using 3-wire PRT/RTD add 0.013 Ω to the accuracy specification for internal resistance mismatch and voltage offset if using Channel 1, or add 0.05 Ω if using channels x01 through x20. If the environment temperature is outside the specified range, multiply the temperature coefficient numbers by the temperature deviation and add to the accuracy specification. 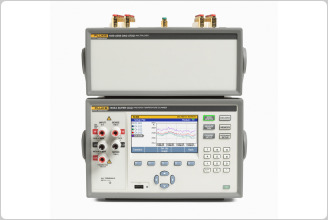 Accuracy is for 4-wire 100 Ω nominal PRT/RTD. When using 3-wire PRT/RTD add 0.039 °C to the accuracy specification for internal resistance mismatch and voltage offset if using Channel 1, or add 0.15 °C if using channels x01 through x20. If the environment temperature is outside the specified range, multiply the temperature coefficient number by the temperature deviation and add to the accuracy specification. Linear interpolation may be used between points in the table. Specifications do not include sensor accuracy. The practical range of temperature measurement depends on the sensor and characterization. 1.5 Ω if using channels x01 through x20, and add external lead wire resistance. Accuracy specifications are for 4-wire thermistor. When using 2-wire thermistor, add the number given in the table to the specification for internal resistance. If the environment temperature is outside the specified range, increase the accuracy specification by 25 % for every 1 °C outside the specified environment temperature range. Specifications do not include sensor accuracy. The practical range of temperature measurement depends on the sensor. Accuracy is given as ± (|% of measurement| + μV). Basic accuracy specification is for medium or slow sample rate. When using a fast sample rate add the number given in the table to the accuracy specification. If the environment temperature is outside the specified range, multiply the temperature coefficient numbers by the temperature deviation and add to the accuracy specification. Accuracy specifications apply using medium or slow sample rate. When using fast sample rate, increase the accuracy specification by 25 %. If the environment temperature is outside the specified range, increase the accuracy specification by 12 % for every 1 °C outside the specified environment temperature range. Accuracy with fixed/external CJC does not include the accuracy of the reference junction temperature. Linear interpolation may be used between points in the table. Specifications do not include sensor accuracy. The practical range of temperature measurement depends on the sensor. Accuracy is given as ± (% measurement + % of range). Basic accuracy specification is for Channel 1, medium or slow sample rate. For channels x01 through x20 or when using Fast sample rate, add the numbers given in the table to the accuracy specification. If the environment temperature is outside the specified range, multiply the temperature coefficient numbers by the temperature deviation and add to the accuracy specification. - Input beyond ±12 V is clamped. The clamp current is up to 3 mA. Accuracy is given as ± (% measurement + % of range). Basic accuracy specification is for medium or slow sample rate. When using a fast sample rate, add the number given in the table to the accuracy specification. If the environment temperature is outside the specified range, multiply the temperature coefficient numbers by the temperature deviation and add to the accuracy specification. Max. Lead Resistance (4-wire ohms) 10 Ω per lead for 100 Ω and 1 kΩ ranges. 1 kΩ per lead on all other ranges. 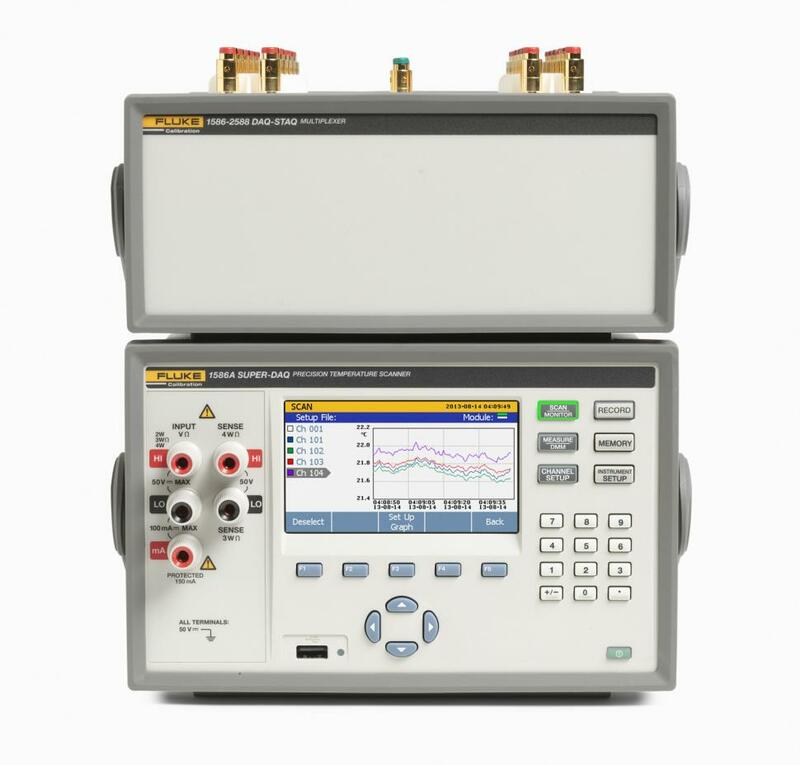 Fluke DAQ 6.0 Application Software for Fluke data acquisition products.